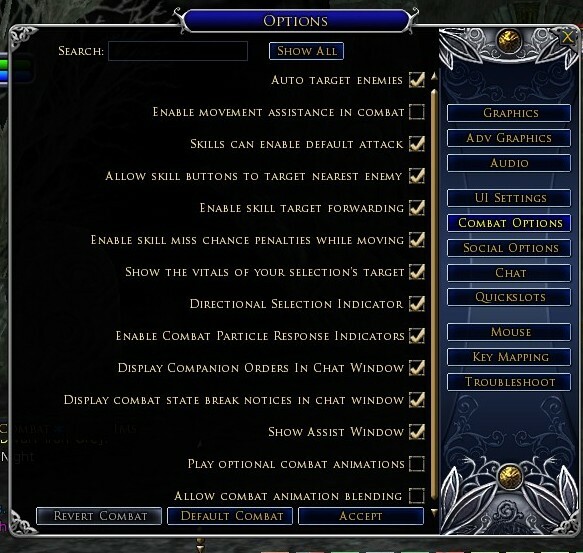 Sometimes when a new player logs in to a game, they just stand there in confusion with all of the many buttons!!! You have the general health bar, power bar, skill bar, inventory bags, etc. that are present in every combat/exploring game. Then you have a slough of options to wade through as you make seemingly unimportant decisions about whether you automatically loot all, or have trivial quest icons shown, or have static tooltips, or even have tooltips at all. I hope to guide someone with this post, even if they are a seasoned player, to look at some of the options in their…well, Options…and set up their HUD (Heads-Up-Display) in a way that will accent their playstyle. I will briefly explain each box, and the several especially important boxes that need to be checked will be in Bold. This is when if you have nothing targeted, and a mob attacks you, then it targets that mob. I always have this on. This option some PvMPer’s like, but I do not. It broke a while back too, but it essentially turns you to face your opponent if you are ranged and makes it easier to follow if melee. I always have this on. Pretty self-explanatory what it does. This depends on which class I am playing. If you are a ranged class, then I would advise against this, simply because this is an easy way to pull a group before your fellowship is ready. My melee characters have this on, just simply because it is easier. This is super important. This means for example, if a minstrel has the tank targeted for healing, he can pop a few ballads in to tier up, or do a little dps if the fight is going well. If he didn’t have this on, he would have to click on or tab to the mob and hit the skill, then click on or hotkey to the tank again. This is also useful in the fights that require you to dps carefully, such as when the mob heals itself on damage. That way, everyone can target through one person, who has an eye on the buff for the heal, and can target himself instead of the mob when the buff comes up to break all dps at once. This I always have on, as any attacks that land, even if they are far and few between, are better than no attacks at all. This I use as a dps class to monitor my threat. If I can occasionally see the mob’s target flicker to my name instead of the tank’s, then I know to back off and let the tank build more aggro. If I am a tank class, it is for the same purpose, except in the opposite direction. If I see that a mob is targeting someone else, I know I do not have aggro. This setting is also handy for situations that need focus fire. Oh this is so handy! This makes a little tiny line next to your feet that points to whatever you have selected. For classes that rely on combat responses, like burglars and guardians, this is incredibly handy. Sure, there is a sound and a buff that shows up underneath your health bar and on plugins, but nothing beats flashing lights all around your head! This is definitely handy for pet classes to keep track of the skills they try to use, as occasionally they do not successfully fire, for one reason or another. Champions and hunters, click this button. You need to feel bad for randomly using Rain of Arrows or AoE attacks when a friendly loremaster or burglar has mezzed a mob. Shame on you! Loremasters and burglars, click this button. You need to know who to blame when your group wipes because somebody hit a mezzed mob. Everyone needs this checked. This is a huge tool in group management. Fellowship and Raid leaders can select members of the group to be on this window, and it will show their vitals and their targets’ vitals. That way, healers can know where the tank’s health is quickly, and everyone knows what mob is safest to hit because it is getting all of the tanks skills dumped onto it. Purely fluff, turn it off if you have performance issues. might be helpful to mention if you like your layout on one toon to use the /ui layout save/load commands… makes ui setup a breeze. Yeah, good call. I will mention that in the next one. I always forget to use that lol. By the time I discovered it, I had already created all of my toons! Great article. I currently use buffbars, palantir and manager – but I’m definitely going to have a play with Tonic bars now – especially with my LM. How long does it take to set up for one toon? It really depends on what you are planning to do with it. I can usually set up a new bar that suits my needs in about 15 seconds. Once you have done it a couple of times, you can do it pretty quickly. On the LM, you could set up the pet bar to get accustomed to it, then use your imagination! Pretty much anything you want to do, it will do. That’s why I like it so much!